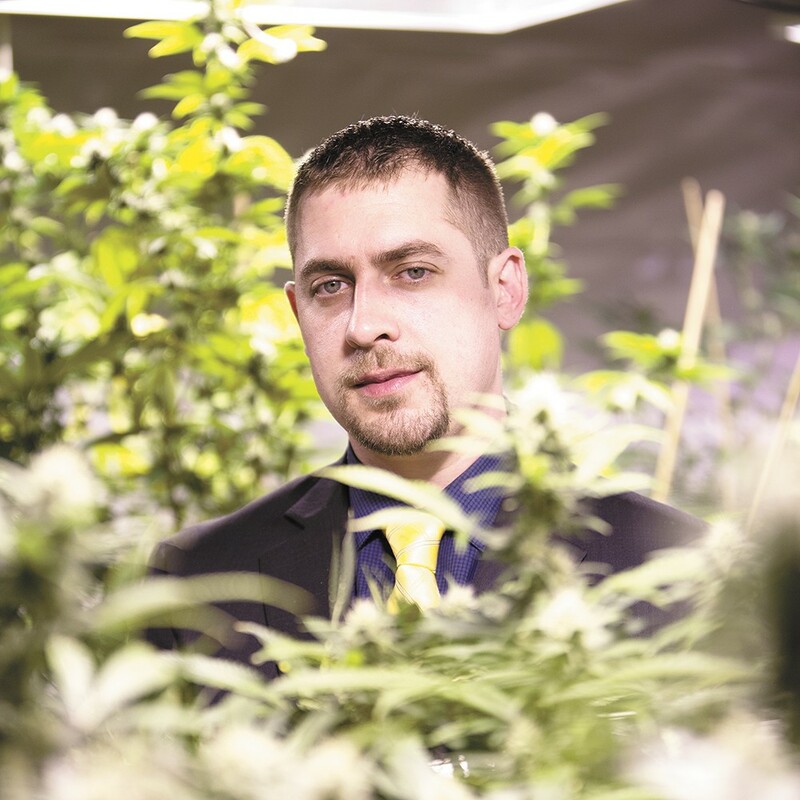 Sean Green, 32, owns medical marijuana dispensaries in Spokane and Seattle and received the state's first recreational marijuana producer/processor license. The cameras flashed. His tone was historic. "We're living the American dream today, here, right now. ... Cannabis prohibition is over." The crowd erupted in cheers; then came the flood of media requests. "The world wants to talk to us," Sean Green says of the attention that at times in the past week has overwhelmed him, starting with the ceremony in Olympia where he received the state's first license to grow and process marijuana. The next day, in a cluttered office at Kouchlock Productions, a North Spokane medical marijuana dispensary where he'll open his recreational grow, Green, 32, is in jeans and sneakers. His photo and story have blanketed statewide and national media, so he says he's "going incognito" compared to his usual suit and tie. Dozens of voicemails await him, and he keeps an eye on the feed from a security camera in the lobby as two TV reporters show up for sound bites. He doesn't hide his annoyance with yet another interview. "I know it's part of it, but it's very distracting," he says. "I have work to do. I have to go grow some cannabis. I really should be taking clones right now." The license will allow Green to grow and process up to 21,000 square feet of marijuana to sell to retail stores. The Washington State Liquor Control Board will continue issuing producer and processor licenses this month, then move on to a lottery for retail licenses with stores expected by June. After months of inspections and background checks, board members lauded Green as a model applicant. "You have to be a hustler to get through the system," says board member Chris Marr. But now that the spotlights have dimmed, even the board's model licensee is up against the uncertainties of an industry still being built. A Spokane native, former self-employed real estate appraiser and self-taught marijuana grower, Green owns medical marijuana dispensaries in Shoreline and Spokane and has been outspoken in the I-502 rule-making process since the measure passed in November 2012. Green owns Pacific Northwest Medical, a medical dispensary with locations in Shoreline and Spokane, and his newly licensed recreational production company is called Kouchlock Productions. He doesn't own the Spokane dispensary by the same name, but he works as a "consultant" there, leases the building where it's housed and that's where he'll start his recreational grow. In his application for the license are plans for growth, too. 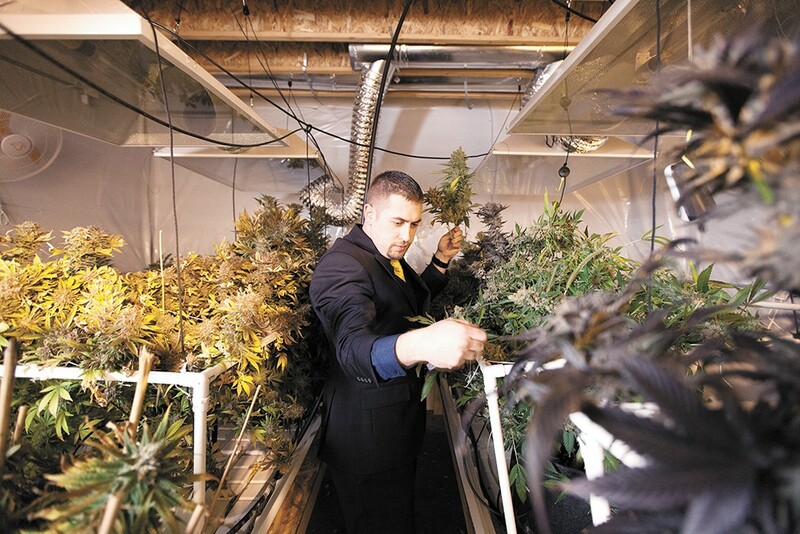 By the spring, Green plans to expand his operations to outdoor growing on a lot in Elk. Ultimately, he hopes a retail store applicant will be approved to lease a portion of the building, pairing a demand with his supply. As part of his application, Green had to provide financial information, which shows Pacific Northwest Medical's annual revenue at $800,000 and Green's salary at $130,000 a year. "The applicant's income from another business is more than sufficient to fund the new business," wrote the license investigators who gave Green final approval late last month. Green's own journey mirrors that of the larger movement: self-teaching, trial and error, looming risk. Medical marijuana is now legal in nearly half of the states and American attitudes toward marijuana have been consistently shifting. Last fall, for the first time, Americans asked by Gallup said they support legalizing the drug. Now, the industry is dealing with a new identity crisis as it reconciles vestiges of stoner culture and the soon-to-be big business of pot. Green also seems to be navigating that divide. While the name of his business refers to being too stoned to leave the couch, he works to present himself as a serious entrepreneur, paying his taxes and wearing suits to state and city meetings — "I want to be taken seriously when I walk through the door," he says. Novelty aside, legalization efforts have brought the issue to the doors of politicians and rule-makers who may have never expected the job. They're now being asked to understand a hidden industry and make judgments about regulations and people in a business they previously knew little about. In Spokane, city planning staff and councilmembers have waded into how to zone for the new businesses; Councilman Mike Fagan has made a practice of reporting to meetings about the topic with the latest count of dispensaries in Spokane from weedmaps.com. Councilman Jon Snyder started a council subcommittee dedicated to the implementation of I-502, where Green joins rule-makers at a conference table once a month and Snyder says he's been "clear and articulate" with his input. "Spokane has got to be committed to dismantling the black market," Snyder says. "It's our job to do that, and we can't do it without successful licensees." Green's not short on ideas for his new venture. He someday wants a nationwide chain of grow operations and retail stores, and since he received the license, he's offered I-502 consulting and grow equipment for sale. But there's a lot more work to be done first. Green will transition his first plants from medical to recreational and print the employee ID badges the liquor board requires everyone to wear in the grow room. The space is equipped with security cameras, alarms and a tracking system to follow the pot from seed to sale. Even once he starts growing, bigger issues remain, most notably in services the industry has trouble accessing because of its murky legal status. Sean Green harvests "Strawberry Sour Diesel" marijuana. At the Liquor Control Board's announcement, a Seattle Times reporter surprised Green when he asked about two complaints filed against him with the state Department of Labor and Industries regarding withheld wages. (One of the complaints also alleges sexual harassment of another employee, but the Times reported there have been no complaints filed against Green or his business with the Human Rights Commission, which handles sexual harassment claims.) While marijuana applicants undergo a background check, L&I complaints are not considered. Green reportedly first said he wasn't aware of the complaints, then that he wouldn't address them. Notes from the department agent who investigated the wage claims show Green and his accountant disputed them for nearly two months before paying the complainants, resolving the complaints. Today, Green dismisses the issue as "so what" and says it was the result of a lack of credible accountants willing to work with a marijuana provider. He says he has since hired a new accountant. Green's medical businesses doesn't have a way to take credit cards, and neither will the new recreational one until he finds a solution. He has had six bank accounts closed. While he says he's always had a "plan b, c and d ready," the problem of banking is a serious one that forces the marijuana industry to deal almost entirely in cash. Green briefly began accepting Bitcoin, but even the controversial online currency wouldn't do business with a pot grower. Just this week, the owner of another Spokane dispensary reportedly shot a man outside because he worried the man was going to burglarize his business. Because of the drug's federally illegal status, banks are hesitant to do business with marijuana growers or sellers. In February, the Justice and Treasury Departments released guidelines meant to ease banks' concerns, instructing them to label marijuana accounts believed to be operating in good faith as lower priority than other types of illegal activity. But that's not enough for some. Theoretically, the next administration could simply reverse the guidelines. To truly make the business risk-free, federal law would have to change and that's unlikely for now. In Spokane, Green says he and his fellow entrepreneurs need just one bank or credit union to open its arms to the business.